Luton is one of London's biggest airports and the areas around it can get really busy around the clock. So why not give the early wake-up call a miss and spend some more time under the duvet before your flight? You can get up at your own pace and enjoy a short stroll to the terminal at leisure - just how the start of a holiday should be. If you book a Luton airport hotel with HolidayExtras.com® today you can save up to 40 per cent on the experience. What is a Luton on-airport hotel? Luton on-airport hotels are situated within the airport grounds, the best thing about this is that if you book a room-only package, you won't need to take a transfer - you can simply walk to the terminal. This makes it an extremely convenient option if you have an early flight, you don't want to wait for a courtesy bus or you just like doing things at your own pace. Whatever your budget, there's a 2 or 3-star on-airport hotel at Luton to suit it and, with HolidayExtras.com's Best Price Guarantee, you know youre getting the best deals. 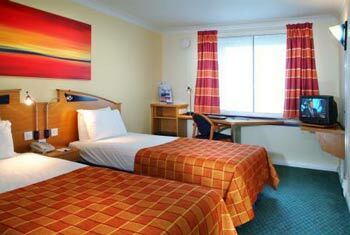 Why pre-book a Luton airport hotel? The best reason to pre-book is always because its an effortless way to save money whilst getting exactly the same service. An advance booking with HolidayExtras.com will always be cheaper than the standard cost of a room on the day  but the earlier you book, the better. This is simply because as hotels book up, fewer spaces are available so they bump up the price. You can make great savings by booking your hotel at the same time you book your holiday. That way youre getting a great price and youre all set for a fantastic trip. What Luton on-airport hotels are there? 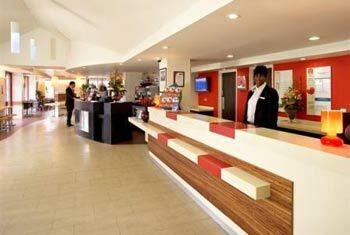 If youre looking for a comfortable and low-cost hotel option then check out the Ibis Hotel. Its clean, modern and in a great location - the Ibis is one of our most popular hotels at Luton airport. The 3-star Holiday Inn Express Luton Airport is right next to the airport, but don't worry, there's triple glazing so you won't even notice. The only thing you'll notice is how refreshed you feel after a few extra hours sleep and the short walk to the terminal.